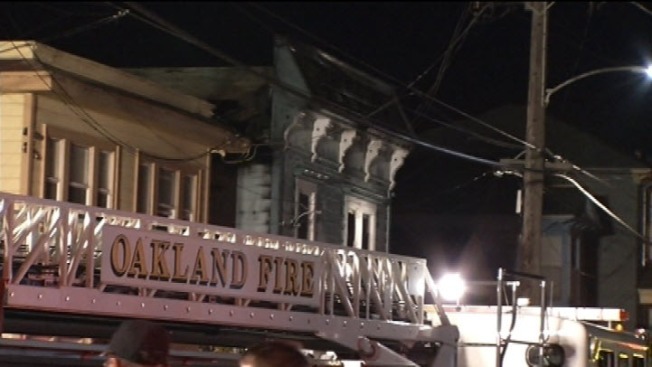 Neighbors in Oakland turned into heroes after they kicked open a door Tuesday morning to save a woman from a three-alarm fire tearing through a Victorian. The fire was reported about 3:30 a.m. from a duplex at 24th at Market streets and neighbors said it sounded like gunfire. By 6 a.m., crews had the fire under control.The fire had jumped to two other buildings. One woman was screaming that she needed help and neighbors called 911 and rushed in to save her. "She was screaming, 'Help, help! I can't get out," recalled Josh Small, who along with a friend kicked down her door to get her out. He had been watching "The Wire" on TV when he heard the screams. Small almost blacked out himself as he was initially engulfed in smoke and fumes. And after tripping down the stairs, he found the strength to race around and save his friend's cats from the fire. Fifty firefighters responded to the scene, and they're now saying it looks like the fire may have been an electrical problem that started in the laundry room. A dozen people were displaced, but everyone got out safely.